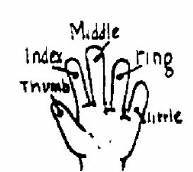 In this experiment you will ink your fingers and roll them onto a piece of paper. This will give you a print of the raised pattern of ridges on your finger. We call this a fingerprint. Start on the left side of your finger and roll to the right. Do not roll back to the left. You will smear your print. This rolled print has a square shape and gives information about the side of the finger. Mom to save them. Have Mom write me a note telling that you made the card. Rolling your finger is important. A rolled print gives more details. Never roll back over part of your print. This may smear your print.